The Great Financial Unknown is now upon us. After 10 years of Quantitative Easing, the European Central Bank (ECB) in Europe owns 40% of the national debts in the EU and it can neither sell them nor stop buying without creating a Panic in Interest Rates. Likewise, the Bank of Japan (BoJ) owns between 70% and 80% of the ETF bond market in Japan. 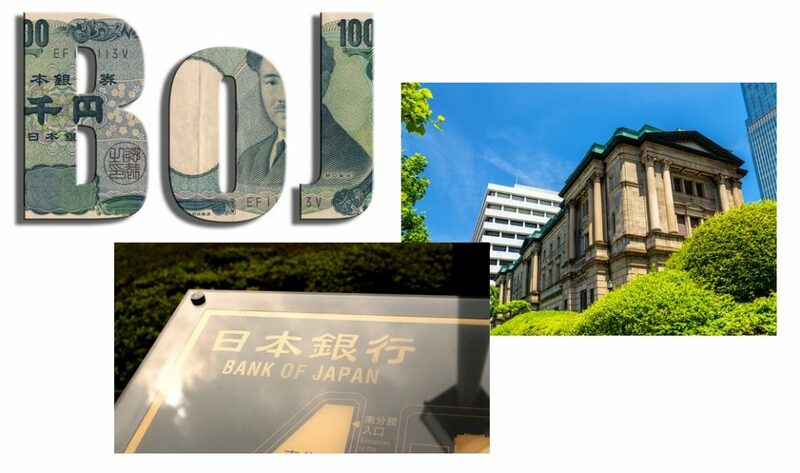 The Bank of Japan confirmed it is ending free market determination of interest rates for the municipal level and that they “will not require any procedures such as auction as the method of determining lending conditions.” today it may introduce a lending facility for its exchange-traded fund buying program, which would allow it to temporarily lend ETFs to market participants. to temporarily lend ETFs that the Bank holds to market participants. The statement at the end of the announcement on the last page on its monetary policy has left traders in shock. This appears that the BoJ realizes that it now effectively has destroyed its bond market and realizes that there is not only the end of a free market, but there is a contagion of surrounding lack of liquidity. necessary for maintaining that target in a stable manner. COMMENT: Well you said this winter would be long and the summer shorter. It is still snowing here in the heart of America. It looks like your computer is correct again. Instead of funding research for billion dollars to pretend there is global warming, they should just subscribe to Socrates. Would save a heap of money. REPLY: Of course you are right. However, the hand out billion grants so they can get studies to justify raising taxes to bring in $100 billion. They are not interested in the actual reliable forecast. There is no juice in that for them. They want more revenue. Unfortunately, if this summer is also short and winter returns rapidly in the fall, buy some electric-underwear. We are in for colder periods ahead into 2024. A prominent Oxford philosopher who is known for making terrifying predictions about humanity has a new theory about our future, and it isn’t pretty. Over 15 years ago, Nick Bostrom, author of Superintelligence: Paths, Dangers, Strategies, made the case that we are all living in a Matrix-like computer simulation run by another civilization. Will humanity eventually be destroyed by one of its own creations? If you find the idea of living in a computer simulation that is run by unknown beings troubling, wait until you hear Bostrom’s latest theory. While speaking to head of the conference, Chris Anderson, Bostrom argued that mass surveillance could be one of the only ways to save humanity – from a technology of our own creation. 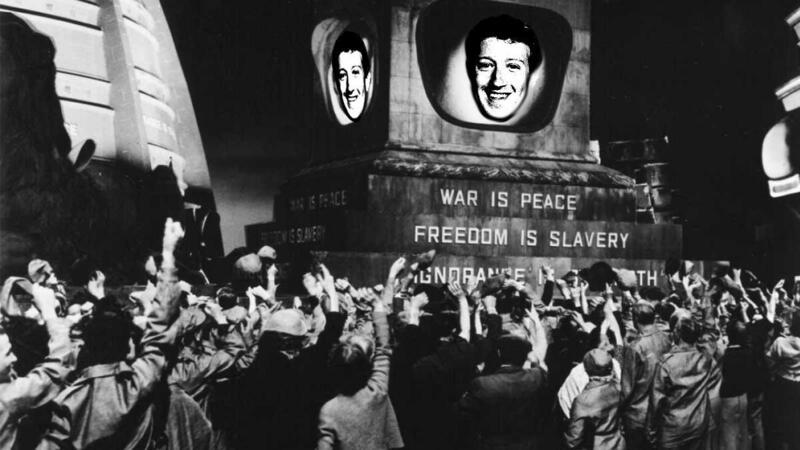 His theory starts with a metaphor of humans standing in front of a giant urn filled with balls that represent ideas. There are white balls (beneficial ideas), grey balls (moderately harmful ideas), and black balls (ideas that destroy civilization). The creation of the atomic bomb, for instance, was akin to a grey ball — a dangerous idea that didn’t result in our demise. Following US declarations that Washington and its allies intend to take Iranian crude exports down to “zero” by cancelling waivers previously granted to eight nations, tensions are now soaring over the Strait of Hormuz, with Iran’s elite Revolutionary Guards (IRGC) attempting to lay down the law amid fears the US Navy could move to block Iran’s access, given the IRGC’s new terror designation. “Those who have designed the policies that are being pursued do not simply want a negotiated solution. But let me make it clear that Iran is not seeking confrontation, but will not escape defending itself,” Zarif said further. The Iranian foreign minister also interestingly suggested the possibility that American operatives or their allies could try “to plot an accident” to create a broader crisis, in perhaps a continued cryptic reference to tensions in the Persian Gulf over the Strait of Hormuz. If you learn one rule about how governments function today, it should be that political leaders are usually puppets and the real decision makers are almost never out in the open. The questions is, how does one know for certain that this is the case with a specific leader? His rhetoric might be compelling, he probably knows every buzzword to spark your interest, and he might even throw you some legislative scraps from the political table every once in a while to make you think that he’s going to follow through on his campaign promises, but does he actually believe in the principles he originally championed? The litmus test for any US president is to examine the type of people he invites into his house. Who does he surround himself with? The cabinet is the president’s constant companion and decision making team. The cabinet is looking over his shoulder and influencing everything he does. If you want to find who is pulling the strings of a president, this is a good place to start. The problem with our current president, Donald Trump, is not that he is very different from previous presidents, but that he is very similar to them in many ways. While conservatives that voted for Trump did so most of all in the hopes that he would follow through on his promise to “drain the swamp”, he has instead been actively filling the swamp with ever more slimy and parasitic creatures. Consortium News has launched a new series titled “The Revelations of WikiLeaks”, geared toward helping readers come to a full appreciation of just how much useful information the outlet has made available to the world with its publications. Which is good, because there’s a whole lot of it. Understanding everything that WikiLeaks has done to shine light in areas that powerful people wish to keep dark makes it abundantly clear why powerful people would want to dedicate immense amounts of energy toward sabotaging it. What’s even more interesting to me right now, though, is that if you think about it, the completely fraudulent arrest and imprisonment of Julian Assange arguably exposes more malfeasance by government and media powers than than what has been revealed in all WikiLeaks publications combined since its inception. And we can use that as a weapon in waking the world up to the dystopian manipulations of the powerful, in the same way we can use WikiLeaks publications. Really, think about it. Thanks to WikiLeaks we know about a military cultural environment in the Iraq war that was toxic enough to give rise to US servicemen merrily gunning down civilians, including two Reuters war correspondents, while whooping and exchanging verbal high-fives. We know that the CIA cultivated a massive cyber-arsenal which enables them to spy through smartphones and smart TVs, remotely hijack vehicles, and forge digital fingerprints on cyber-intrusions to make it look to forensic investigators as though hackers from another nation was responsible, and that they lost control of this arsenal. Bloomberg has it in for Amazon these days. 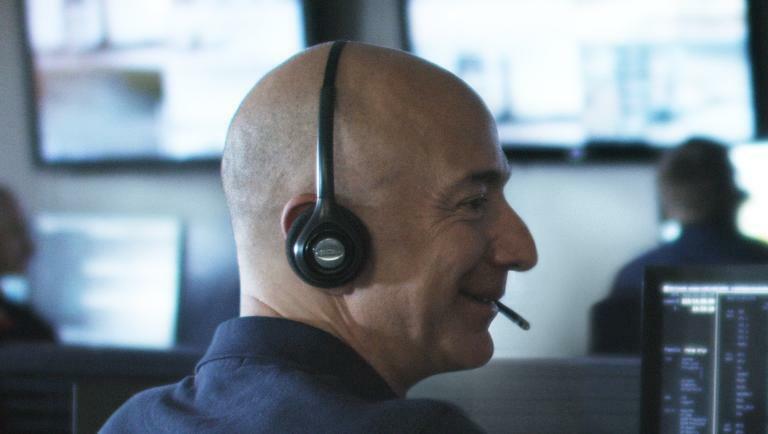 Citing five (supposedly former) employees familiar with the program, Bloomberg writes that the covert “Alexa team”, which is spread across three continents, and transcribes, annotates and analyzes a portion of the voice recordings picked up by Alexa, “to help Amazon’s digital voice assistant get better at understanding and responding to commands”, also has access to Alexa users’ geographic coordinates and can easily type them into third-party mapping software and find home residences, according to the employees (who signed nondisclosure agreements barring them from speaking publicly about the program, which apparently did not prevent them from speaking off the record with Bloomberg). And while there has yet to be any evidence that Amazon employees have attempted to track down individual users, two members of the Alexa team who seem to have grown a coscience, expressed concern that Amazon which is fast becoming the world’s biggest monopoly across virtually every industry, was granting unnecessarily broad access to customer data that would make it easy to identify a device’s owner. 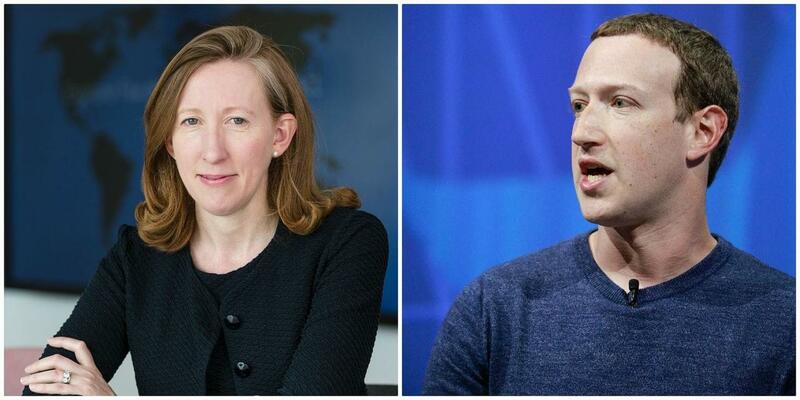 Facebook announced Monday that Jennifer Newstead, a Trump appointee who served in the Department of Justice (DoJ) under President Bush, will join the social media company as General Counsel, supervising its global legal functions. Newstead replaces Colin Stretch, who announced in 3Q18 that he will exit. Stretch will remain with Facebook through the transition phase, expected to be completed in the coming months. Newstead brings a terrifying history of lobbying and legislating for an Orwellian style of mass electronic surveillance of Americans. The Hill explains she was credited with writing the controversial 2001 Patriot Act, a piece of legislation that stripped Americans of their First and Fourth Amendments in the name of fighting the War on Terror. 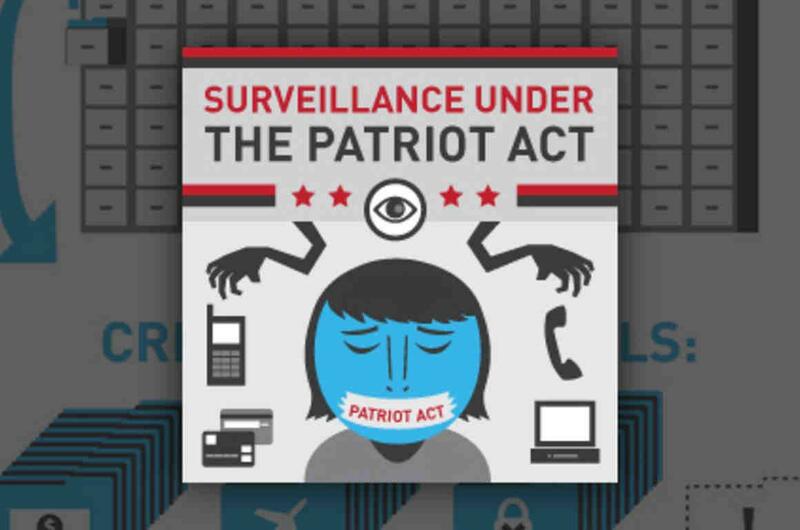 Congress enacted the Patriot Act in the wake of September 11, 2001 attacks, the Act expanded the scope of the government’s surveillance powers to investigate terrorism, organized crime, and drug trafficking. It allowed government investigators to use roving wiretaps and the ability to collect telephone records from US carriers. During this month’s Spring Meetings in Washington DC, the IMF and World Bank held their annual Development Committee conference which looked at the economic outlook and potential risks for the global economy. As is tradition, IMF head Christine Lagarde produced a written statement outlining several areas of priority. All of them were predicated on ‘reaching the 2030 Sustainable Development Goals‘. Whilst on paper the statement is geared towards emerging and developing countries, elements of it relate notably to western nations such as the United Kingdom, despite Britain being considered an advanced economy. In countries with elevated inflation or where exchange rate depreciations could trigger inflation pass-through, central banks should focus on containing inflation expectations (Angola, Argentina, Iran, Turkey). By contrast, monetary policy can be more accommodative where expectations are well anchored (Brazil, Indonesia). 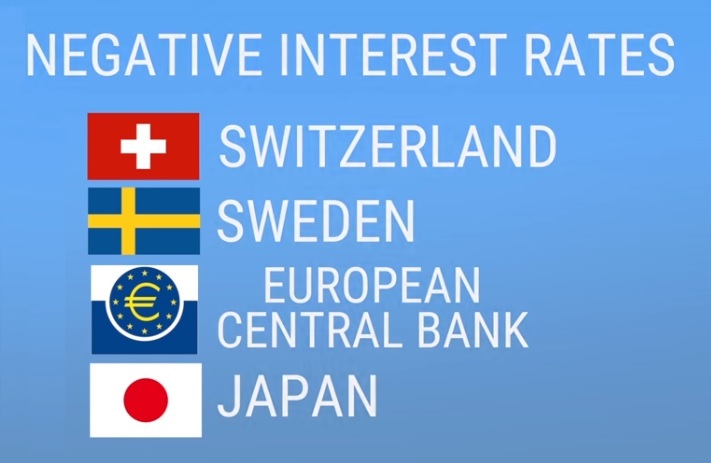 In October 2018, a communique from the thirty-eighth meeting of the International Monetary and Financial Committee stated that where inflation was ‘close to or above target‘, central banks should tighten policy. On the opposite end of the scale, banks should ‘maintain monetary accommodation where inflation is below target‘. Vast swathes of the West seem not to realize that if the Strait of Hormuz is shut down a global depression will follow, writes Pepe Escobar. The Trump administration once again has graphically demonstrated that in the young, turbulent 21st century, “international law” and “national sovereignty” already belong to the Realm of the Walking Dead. As if a deluge of sanctions against a great deal of the planet was not enough, the latest “offer you can’t refuse” conveyed by a gangster posing as diplomat, Consul Minimus Mike Pompeo, now essentially orders the whole planet to submit to the one and only arbiter of world trade: Washington. First the Trump administration unilaterally smashed a multinational, UN-endorsed agreement, the JCPOA, or Iran nuclear deal. Now the waivers that magnanimously allowed eight nations to import oil from Iran without incurring imperial wrath in the form of sanctions will expire on May 2 and won’t be renewed. The eight nations are a mix of Eurasian powers: China, India, Japan, South Korea, Taiwan, Turkey, Italy and Greece. Apart from the trademark toxic cocktail of hubris, illegality, arrogance/ignorance and geopolitical/geo–economic infantilism inbuilt in this foreign policy decision, the notion that Washington can decide who’s allowed to be an energy provider to emerging superpower China does not even qualify as laughable. Much more alarming is the fact that imposing a total embargo of Iranian oil exports is no less than an act of war. Saudi Arabia plans to stay within the limits of its ceiling under the OPEC+ production cut deal in May and will certainly not rush to ramp up production, although it would respond to customer needs if they want more oil, Saudi Energy Minister Khalid al-Falih said on Wednesday. While the U.S. and President Trump appear certain that Saudi Arabia would compensate for Iranian losses, the Kingdom seems reluctant to start swiftly raising production before seeing actual figures for how much Iranian oil will actually be lost and how tight the market will be. Saudi Arabia’s oil production in May is pretty much set and will differ “very little” from previous months, Reuters quoted al-Falih as saying in Riyadh today. Last month, OPEC’s de facto leader and largest producer Saudi Arabia followed through its commitment from February to cut deeper and pump well below 10 million bpd in March. Saudi Arabia’s crude oil production dropped by a massive 324,000 bpd from February to stand at 9.794 million bpd in March—just as al-Falih had said the Kingdom would do. Saudi Arabia pumped around 9.8 million bpd in March, some 500,000 bpd below the 10.311-million-bpdcommitment in the OPEC+ deal. It’s time to choose a new direction. Every so often, our work in the premium side of PeakProsperity.com is deemed so important that our paying subscribers request we share it with the general public. Last week’s ‘Off The Cuff’ podcast received so many of these requests that we are releasing it to all here. In last week’s Off The Cuff podcast, Chris delivered a very personal message about how we each decide to live our lives. A growing number of people are watching the “prosperity” around them — record high asset prices, record-low unemployment, new technologies, etc — and yet feeling that we’re making the wrong trade-offs as a society. All that wealth is flowing into fewer and fewer pockets, ecosystems are faltering and an alarming number of species are dying off, depression rates (especially among the youth) are skyrocketing. In short: there’s more money flowing around than ever, and yet we and the planet are becoming sicker and unhappier. From Chris’ point of view, it comes down integrity. The modern human way of life lacks integrity as a guiding principle. For those of us who desire a better future, brining our actions into better alignment with our integrity is the path to true prosperity. My ultimate diagnosis of what’s going on in the United States culture and a lot of Europe culture — probably in other cultures, but I can’t speak to them as well – it’s that they lack integrity. Now, integrity isn’t simply “Oh, I don’t lie”. Integrity means that your actions are for the greater good. Sometimes there are acts of integrity which actually are not optimal for you; they’re optimal for the larger society around you. Integrity is thinking out seven generations. Integrity is saying that beauty matters in our life, and that when we take out a species, we’re taking away something extraordinarily beautiful. The climate is changing, and humans are contributing to these changes. We believe that there is much common ground on which all sides of this discussion could come together to address climate change with policies that are practical, flexible, predictable, and durable. The US Chamber of Commerce, through its Global Energy Institute (GEI), recently announced the launch of a major new climate initiative called the American Energy: Cleaner, Strongercampaign. It’s admitted purpose is to “counter the Green New Deal (GND) with an energy innovation agenda…to persuade the public and Congressthat technology is better than regulation in addressing climate change.” (emphasis added). In taking a swipe at the GND, the Chamber has handed its progressive Democratic authors and supporters a key victory—certainly something it had not intended to do. Whatever the Green New Deal is or isn’t, the idea of it has accomplished what was thought Impossible just months ago–the admission by traditionally conservative deniers that climate change is real and needs to be acted upon now. The Chamber’s announcement boldly states inaction is not an option. The actions to be taken, however, remain matters of dogmatic ideological debate. On its face, the Chamber’s call to action is a far cry from its 2017 policy priorities. Today climate change is on the minds of voters because it is on the lips of every Democrat in Congress, as well as those vying for the party’s presidential nomination. The Chamber’s newly announced campaign is an effort to remain relevant. Not every Democrat has embraced the GND. All, however, have acknowledged that climate policy is one of the Party’s top three priorities going into the 2020 elections. There have been numerous signs that the U.S. is likely to go through another major recession at some point. And regardless of when or if a recession happens, it won’t change the fact that the U.S. economy is already in hot water. 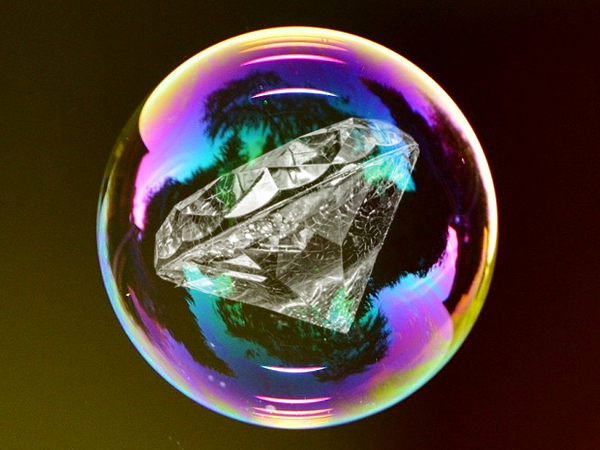 Today the United States sits in the midst of the largest wealth bubble in post-World War II history, as measured by household net worth (or wealth) relative to gross domestic product. As I showed in detail recently in the Journal of Business Economics, only two other postwar bubbles come close, with peaks in 1999 and 2006, just prior to the tech stock crash and the Great Recession. As you can see at the bottom, the wealth bubble is “5 times the size” of the GDP. But notice how the wealth bubble “pops” just before the 2000 and 2008 recessions. 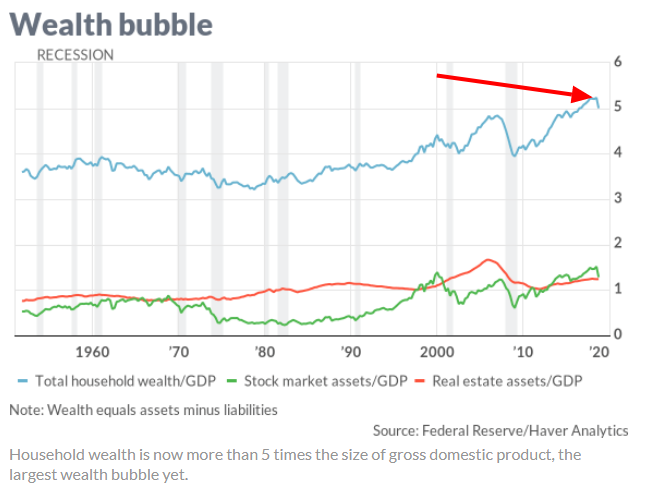 If you look at the end of the blue line, it appears the largest wealth bubble since World War II may already be popping. Also notice how the green line dips before the 2000 tech stock “recession,” and the red line before the 2008 recession (caused mainly by subprime mortgages). In both prior bubbles, the crashes led to a drop in the value of net worth to about 4 times GDP. Even that level remained high relative to prior history, since in no single quarter before 1998 had the household net worth-to-GDP ratio ever reached 4.0 or higher.